I like seasonal products because you have to wait to the right time of the year, and when they arrive, they are much more appreciated. Furthermore, we link them to certain habits and ideas, so you are transported to that time of the year just by remembering them. That happens to me with horchata. Its season is limited to summer, and that is why it is inseparable from the heat, the sun and the muggy weather. 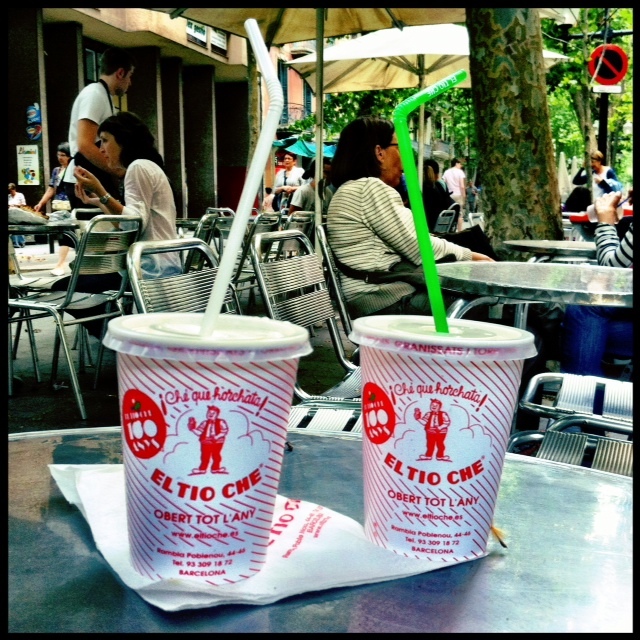 And in Barcelona it is clear that drinking horchata is already a tradition, especially at a terrace. There are historical horchaterías, like "Tio Che" at La Rambla del Poble Nou, which this summer celebrated its Centennial! The founders were Joan and Josefa, who, coming from a village in the province of Alicante, began serving horchatas in the Born one century ago. And their family is still cooling the hot afternoons in Barcelona with this nutritious drink. Congratulations Tío Che! The main purpose of ​​this blog, as its name suggests, is to collect some things that are really typical in Barcelona. And the truth is that there must be few traditions that are more typical from Barcelona than l'Ou com balla (The dancing egg), held on the day of Corpus Christi. although it is also celebrated in other catalan cities and villages, this tradition has its origin in the Cathedral of Barcelona, and is known at least since 1673. The idea of this celebration is to make an egg dance. The egg has previously been emptied, of course, and you can see it dancing in fountains of cloisters, courtyards and gardens that are decorated for the occasion with spring flowers and fruits. If you have never seen it before, it is worth going to see the dancing egg, which moves playfully over the water. It is a simple but very mysterious ritual at the same time, which rememorates the consecrated host and has also clear references to the fertility of the egg. The tradition was lost for a while and the city recovered it some years ago, so now you can go see the egg dance in various locations in Ciutat Vella, as the cloister of the Cathedral, la Casa de l'Ardiaca, l'Ateneu Barcelonès, the Archive of the Crown of Aragon or the Museu Frederic Marès.